Fingerprint Digital, Inc. has been quietly building a platform of functional and educational gaming apps for kids ages 3-8 years old, and is launching seven new apps soon. Green$treets: Unleash the Loot! (free) launched this week and quickly became the #1 kids’ educational app in the iTunes App store. A fun financial game developed in conjunction with best-selling author Neale Godffrey and designer Tom Hester, creator of Shrek, the app helps kids understand the value of money and how to make good financial decisions. 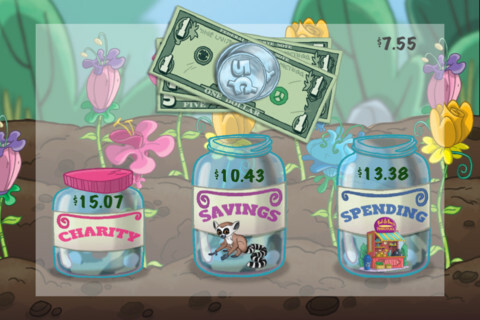 While rescuing endangered animals in the town of Green$streets, kids can earn money, give to charity, and set saving goals. It’s aimed at 5-8 year olds. Fingerprint has 21 apps available on their platform, and they’re working toward adding another 40 in 2013 with a focus on making learning fun. Some of the apps include a sequel to Scribble Press called Scribble My Story where you can write, illustrate, and then customize stories. Panda Panda No More Mess is a sorting game designed to teach shapes and colors, and Fingerprint will have four Step-By-Story apps as part of the VeggieTales Collection. Kids can now read The Goofy Gift, Thanks for the Franks, Larry’s Missing Music, and I am That Hero! Check out Green$treets and we’ll keep an eye out for the new Fingerprint apps as they hit the iTunes app store in the coming weeks.